"our personal information and private data is... often protected only by a single password"
"act responsibly and ethically... while safeguarding their own information"
Using the Tech policies and protocols explained in the Lanna Secondary School Student-Parent Handbook (2017-18 ed. ), which is published yearly by the Lanna International School in Chiang Mai, Thailand (chosen as an example, other school policies may vary); an infographic was synthesized from the information to simplify the protocols for dealing with technology in school and any problems that may arise. The example infographic can be downloaded in PNG format, it was made using the tools at canva.com. "Digital citizenship" is defined as the social norms of appropriate and responsible technology use, (Ribble, 2017). 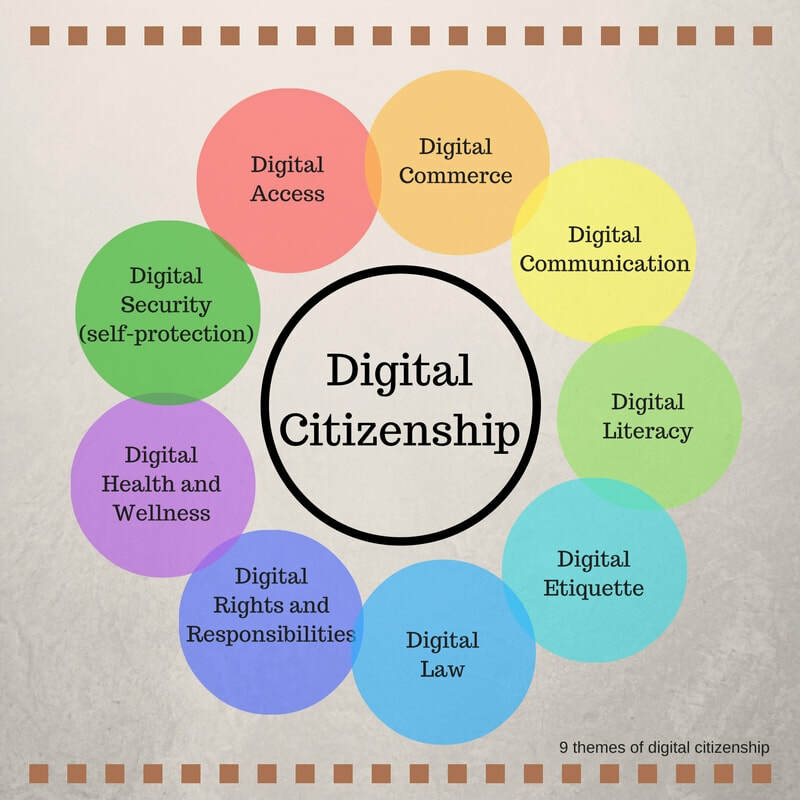 The Nine Themes of Digital Citizenship outline the rights and responsibilities of internet-connected people. Simply understanding how to be a good digital citizen and the benefits thereof or consequences of acting in a malicious way online can address many of the problems associated with hacking and security issues. More information along with links to helpful websites can be found below the JIT lesson on this page. The following Classroom Technology Guide and the Digital Citizen resources at the bottom of this page can help students, parents, and teachers become safer more responsible users of internet technology while at the same time protecting their privacy and managing their online profiles to keep a positive and beneficial internet presence. Here is a list of important things to keep in mind about our digital footprints and the effects that they can have on our future educational or job opportunities. Once we've cleaned up any negative things in our digital footprints that we can, then a good practice is to intentionally create a positive web presence that will highlight our work and contributions to society. Click the button below for an online presentation to help students understand hacking concerns and how to protect their privacy while online and manage their digital footprints. The following is a “just-in-time” (JIT) lesson in the form of a provocative open ended question which allows an opportunity for students to “take a stand and justify their position” (Novak, 2014). These questions can be answered to identify protocols, possible problems and solutions/support options from the LANNA Secondary School Student-Parent Handbook, (Lewis, 2017). The infographic above can help to inform students, parents, and teachers about the protocols outlined by the school. You have received a school-issued laptop, what kinds of activities are you allowed to do with that laptop? How can you properly care for it, and your accounts and data stored on it, to avoid any problems? If you do have any problems, how can you get it fixed and who should you talk to for help? Include at least 5 problems that you might have and precautions/solutions. What kinds of problems could be caused for other students, teachers or parents by engaging in unethical behavior online or with computers/phones? Include at least three problems and ways that creating difficulties for others can be avoided. The JIT lesson was created to initiate critical thinking about using school and personal technology resources for educational purposes while being aware of the school policies, ethical considerations and possible problems. 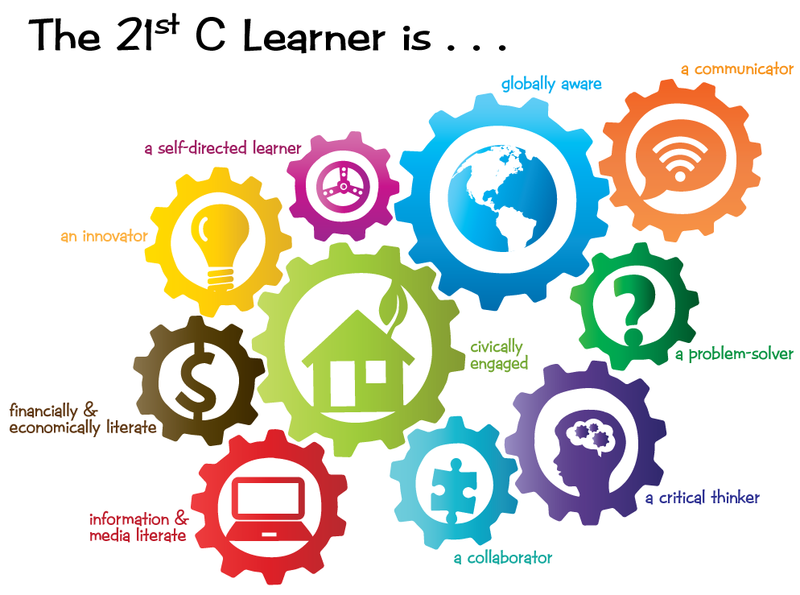 It addresses several of the ISTE standards relating to becoming an “Empowered Learner” and a “Digital Citizen” (ISTE Standards for students, 2017). Note the 9 themes in the following infographic and continue reading below for more information on alignment. 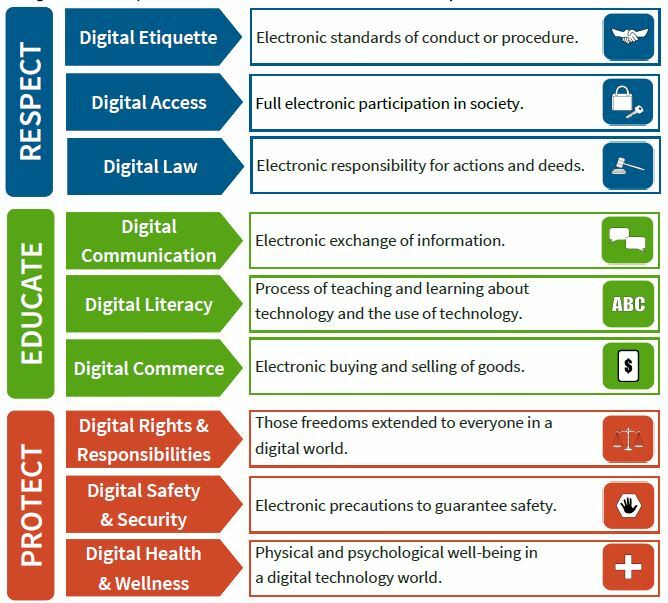 Many of the issues addressed in the lesson and info-graphic are outlined in the Nine Themes of Digital Citizenship (Ribble, 2017). Specifically aspects of themes 5, 6 and 9: Digital Etiquette, Digital Law, and Digital Security are covered in the resource and explored in the lesson. These important themes will require much more than just one lesson to fully illustrate, but this is a start. Here are some excellent resources from "Common Sense Education" for learning about and teaching digital citizenship including privacy, security, safety, and other concerns. And a few more helpful graphic resources below. 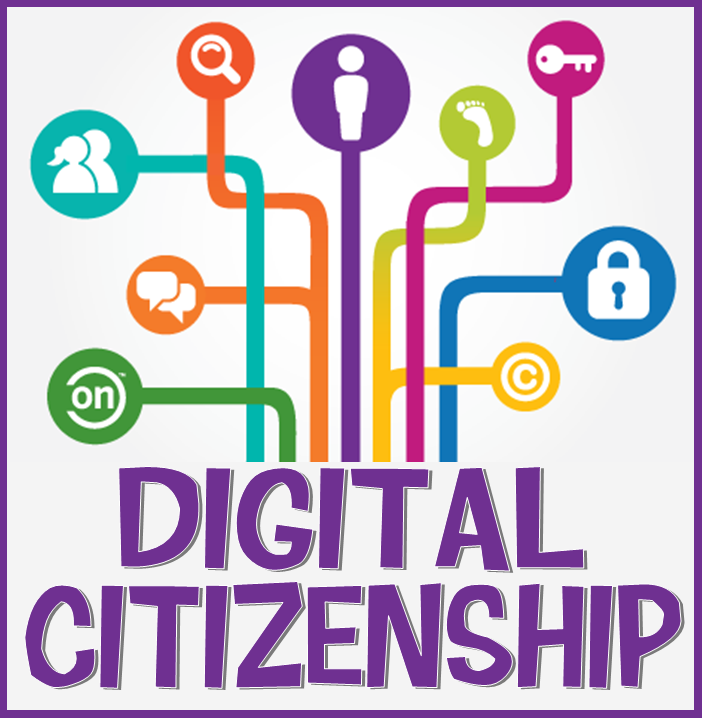 Continue to the Forum for a contact form and additional useful resources for Students, Parents, and Teachers about digital citizenship and online tools to make presentations and graphics.